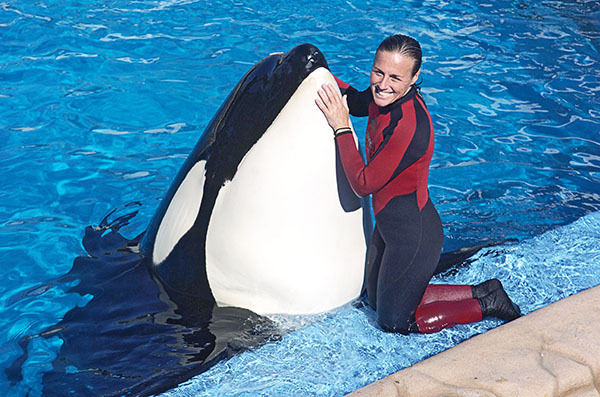 Dawn Brancheau, a whale trainer at SeaWorld, was pulled into the tank yesterday after a show and tragically killed. Reports say that the whale has been considered dangerous by staff, and only certain trainers were able to work with him. This leads to the question – why was he there? The 12,000 pound whale pulled Dawn under the water after a regular performance, as she was rewarding him. Onlookers that witnessed the horrible event said that the whale was acting violently with the trainer. This isn’t the first death that has been connected with the killer whale. Tilikum and two other whales drowned another trainer, Keltie Byrne, in 1991 at a park in Canada. In 1999 at SeaWorld, a man snuck into the whale tank to swim with them. He was also killed.